You’re out with friends or family in an unfamiliar place, and there’s a terrible noise: it’s your stomach, demanding food. The problem? You’ve got no idea where to find a decent eatery that will please everyone. You could stalk the streets, scanning for the nearest recognizable fast food joint, or get a bit fancy and type ‘restaurant’ into Google Maps. Unfortunately, neither option gives you the inside scoop on where’s good to eat – but help is at hand, in the shape of myriad dedicated eating apps. Today we look at one our favorites – KtchUp! What is KtchUp all about? This is a very useful cross-platform restaurant app that helps users decide where to eat their dinner or lunch. The app is free, it shines with friendly user interface and great graphics, and of course, it offers dozens of options that can enhance your dinner planning experience. 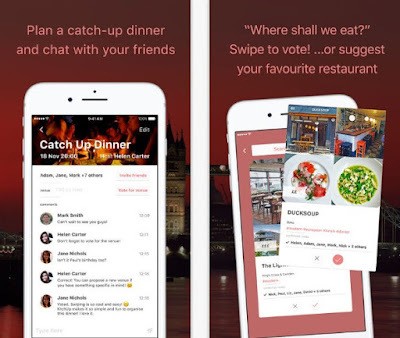 KtchUp is extremely easy-to-use app, letting you plan a perfect catch-up dinner with your friends. All you got to do is create a group chat with your contacts (even those not that don’t use the app), swipe to vote for restaurants you would like to eat at, and book with an ease. Before you all choose a restaurant, you can view restaurant photos and detailed information about the places, like hashtags, websites, menus, locations, links to book, etc. Once you are ready, just tap and book your table at your favorite. On your homepage, discover a list of restaurants that your friends recommend in different areas of London, “Like” restaurants and the app will suggest these to you next time you are organizing a dinner or lunch in London. Where to go and what to eat has never been such a simple task to deal with. Download KtchUp for free from the following links and enjoy your catching-up!